I got an EVEmail from Agent Raqn Paudeen in which he made an interesting suggestion to help out his fellow bumpers. 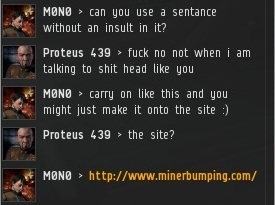 We have been encountering a number of miners who cannot speak English (or at least pretend not to). We've had our share of experiences with Google Translate, but what if we got some extra help? Raqn's suggestion is to have certain common phrases get translated into other languages by people who actually speak those languages fluently. From what I've seen, Russian tends to be the most common language for non-English-speaking miners, but others report German being used with some frequency. If you can translate such phrases into another language, leave a comment with the phrase and its translation. If we get enough genuine translations, perhaps I can make a future post with an abbreviated bumper "guidebook", like those pamphlets they give to tourists so they can ask people where the biblioteca is. Agents could refer to the post and copy-pasta them into local, startling the miners with the power of multiculturalism. I know what some of you rascals are thinking, but no funny business! Google Translate and other speakers of the language will ensure that we don't get pranked into cursing the poor miners. "Hello! Are you at your keyboard, or are you another AFK miner or botter? Please respond within 5 seconds or I assume the worst." "You have been found guilty of violating the Code. Pay me 10 million isk or risk bump. See www.minerbumping.com for details." "Your petty insults will gain you nothing. You must comply." "Your name will be written with a Red Pen if you continue. Make your payment and join the New Order!" Several days ago, I wrote about the "nerf New Order" threads that popped up on the EVE-O forums. Over the past week, there has been an even greater uptick in buzz about the New Order. The general discussion subforum has been filling up with threads that either directly address the New Order and its Supreme Protector, or otherwise delve into the topic of highsec mining and what needs to be done about it. Some of this is in response to our Gallente excursion. I will address that more fully in an upcoming "State of the Order" post. Today, I'd like to talk more generally about why the New Order has gripped the attention of the EVE populace to a seemingly disproportionate degree. Since it's a related topic, I'll also speak briefly about the phenomenon of denialism. Whenever one of these threads pops up, certain disgruntled forum residents blame it on "another James 315 alt". Actually, I don't post on any alts. Alt accusations are a form of denialism that's been around right from the start. 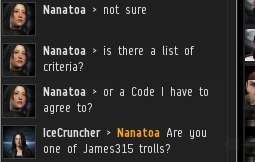 When I founded the New Order a little over four months ago, anyone who stopped by Halaima local to voice support for me was accused of being my alt. Then my shareholders were accused of being either fake accounts or my alts. When the first bumper Agents appeared, they joined the ranks of my so-called alts. The great bumper fleets we organized in October put an end to the in-game alt accusations. I don't often see my Agents or shareholders accused of being alts, though occasionally you'll see a denialist or two who thinks no miner has ever paid the 10 million isk fee. Why does this kind of denialism exist? Because the average highsec carebear is absolutely terrified by the New Order and what it represents. The very thought of an organized society putting an end to carebear anarchy turns the denialists purple with rage. They would rather believe the New Order doesn't exist than contemplate the future we would create. If the Agents of the New Order didn't exist, they could write me off as a fanatic. But if the New Order does exist, and if it is a rapidly-growing movement, then all bets are off. Then there's the question of why the New Order and its philosophical cousins are so dominant on EVE-O right now. The answer requires us to consider the nature of EVE and its playerbase. 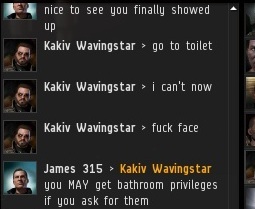 It's often said that the vast majority of EVE players stay in highsec. The percentage is difficult to track, since many lowsec and nullsec players have alts in highsec for making money (this shouldn't be the case, but it is, since risk/reward is so far out of balance). 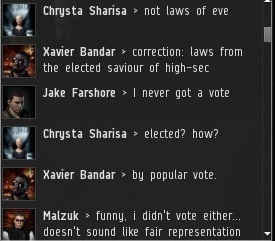 Nevertheless, it would still be fair to say that most EVE players do live in highsec and never venture outside of it. 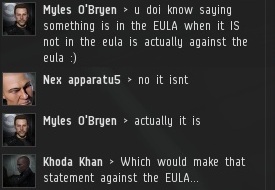 EVE's identity doesn't derive from the masses of highsec, though. 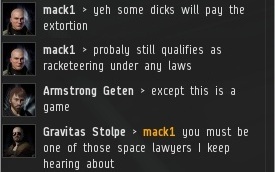 When people think of EVE, they think of the great stories of nullsec wars and shenanigans. Highsec and its sprawling populace are a void. 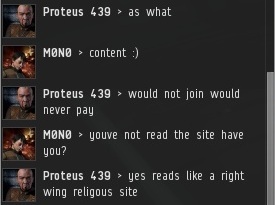 There are few stories to be told in highsec. There are no empires, no territories to be won or lost, no sense of adventure. There's almost no community, no emergent gameplay, no content of any kind. 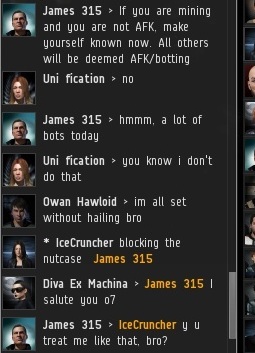 When something does happen worth noting in highsec, like Burn Jita, Hulkageddon, Miniluv, etc., its origin is still the nullsec players, who briefly invade and then leave. 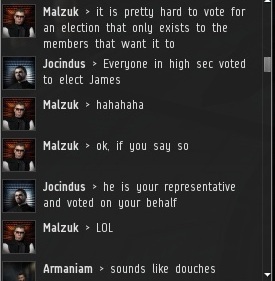 Basically, highsec is a big vacuum. Then came the New Order. We stepped into the emptiness of highsec and began to create. 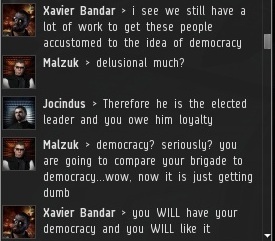 And unlike the temporary events staged by nullsec players, the New Order is here to stay, and to grow. To take over. Forever. For much of the EVE playerbase, the New Order is the only thing happening that is, or could, affect them in the future. Our vision and our Code are the only threats to their routines. Without us, they would continue to mine in silence the same way they have mined in silence for their entire history. And these carebears make up the majority of EVE. Now the buzz starts to make sense. 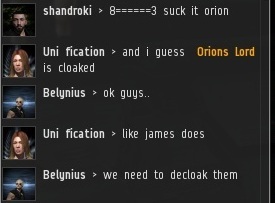 For much of EVE, we are the only ones shaking things up. We are the change. 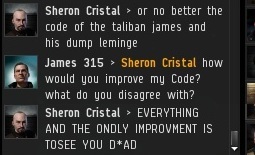 As the New Order continues to grow in strength and influence, don't be surprised if there are days when people act like EVE Online is the New Order Show, featuring James 315 and the New Order Show Band. For many players out there, we're the only channel broadcasting anything. The rest is just static. Our Agents have been very busy in Gallente highsec during our little vacation there. The Aydoteaux system, right next door to our HQ in Tolle, is a popular ice-mining spot. It's also fertile territory for Agents looking to sell mining permits. I stumbled into an ice field full of Code-compliant miners. Agent Tubrug1 showed me around. Talk about gentrification! The neighborhood has much improved since the New Order moved in. It seems our Agents' efforts have not gone unnoticed. The next day, Tubrug1 found a surprise when he logged in. 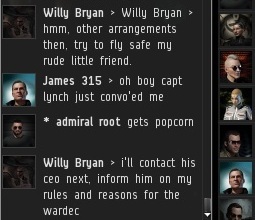 Some unknown person(s) placed a 600 million isk bounty on his head. 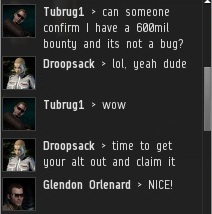 Because bounties can be collected by anyone--including the target's own alt--this was essentially a free gift of 600 million isk from some misguided enemy of the New Order. EVE players can look up the biggest bounties in the game. Because there's no incentive to give your enemy a large bounty unless you're totally ignorant of game mechanics, all of the top bounties are "fake" bounties that people placed on themselves to get on the "top bounties" list. 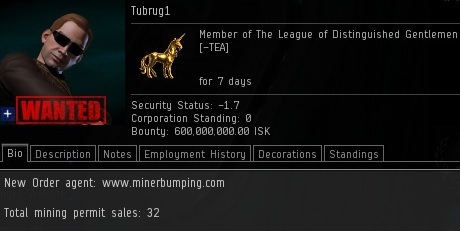 Whoever put the 600 million on Tubrug1 may have given him the largest genuine bounty in EVE. To add an extra pinch of absurdity to the situation, all uncollected bounties will be wiped out in early December, when the next EVE expansion is released. 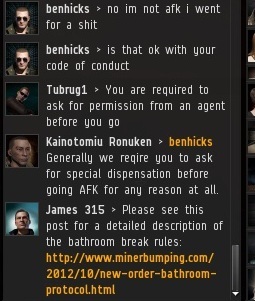 The new bounty system will also be broken, but in a different way. As for my own bounty, it remains locked in at 106 million due to my positive security status. 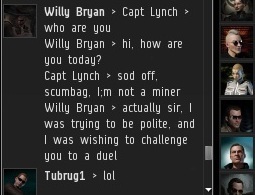 The bounty was placed on me over a year ago by miners angry with my suicide ganking--I had yet to bump a single miner. Will anyone step forward to take responsibility for the giant bounty/gift placed on Tubrug1's head? 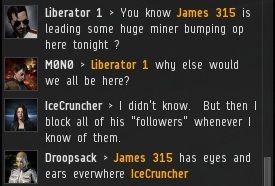 Will disgruntled miners waste their isk on broken bounties after the new expansion? Time will tell! Skeptics of the New Order question what we're all about. They have this idea that there must be some kind of ulterior motive at work. 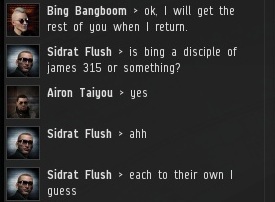 The answer is very simple: I am the Saviour of Highsec. 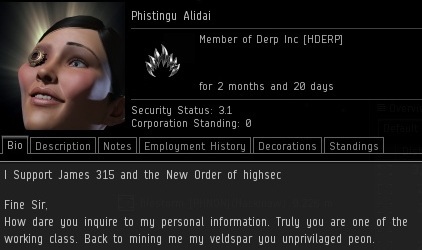 As my title implies, mission is to save highsec. Nothing more, nothing less. After I posted Part 1 of this series, Capt went ballistic. I wasn't sure what Capt's objection was. He had never asked me to keep the conversation confidential, and he seemed to be familiar enough with MinerBumping to know that I occasionally post chat logs here. As the comment section of the post ballooned to more than 40 replies, Capt's additional comments provided illumination. While I've been threatened in the past, I believe this was the first time anyone has ever demanded I remove a blog post. A relatively innocuous one, at that. Capt remained as sphinx-like as ever. What torment? 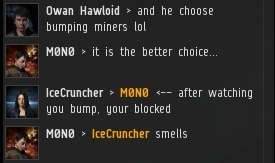 And why did he claim he wasn't a miner when he had clearly mined ice in one of my systems? I'm assuming in this case "IP" stands for "intellectual property", though I don't think Capt's end of the conversation qualified as either property or intellectual. Things escalated when an anonymous commenter began encouraging Capt to sue me. It seemed one of our space lawyer friends had evolved into a fully-fledged internet lawyer. Now the New Order was truly at risk--I had found myself under "lawyer jurisdiction"! Unimportant questions like how posting a chat log constitutes "slander" were brushed aside. But this wouldn't be the first time posting a log was described as slander. That honor goes to Eno Bray, a pioneer in internet lawyering. I'm still not sure who Mr. Peterson is. It certainly can't be referring to me, since everyone knows my last name is 315. Capt soon learned posting legal threats on blog post comments wasn't the panacea it first appeared. So it was time to go to the old standby: The in-game "Help" channel. ...Because the Help channel was so helpful when he reported me for failing to protect one of my systems from a can-flipper. Tzel Mayon > Capt Lynch umm. if its illegal, then report it to the police. 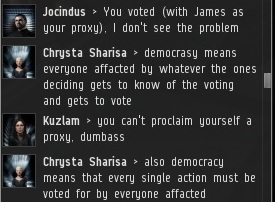 CCP can't do anything about it. And I am sure its not illegal. 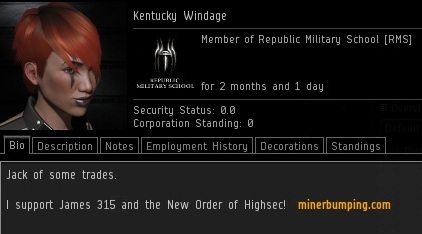 When it comes to highsec, I am the authority. As a matter of policy, I keep things confidential when someone asks to go off the record. Otherwise, permission is deemed to have been given, enthusiastically. Internet lawyering continues to be a popular sport, but I prefer the bumping of miners. In any event, the 24-hour deadline elapsed, and no doomsday occurred. Agent Willy Bryan felt Capt's unsubstantiated allegations about Agent impropriety should not go unanswered. He challenged Capt to a duel. 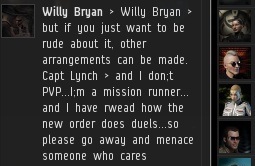 Capt declined, preferring to spend his time on highsec missions. Perhaps things would have ended there, but Capt wished to open communications once more. Capt's manners hadn't improved. This silliness had gone on long enough, I felt. It was time to resolve the Capt Lynch situation once and for all. In my quest to educate, improve, and enrich the lives of miners, I have taught them quite a bit about game mechanics. Specifically, I've tried to bust some myths about ways bumpers can supposedly be defeated. Some of these, such as counter-bumping and the "carebear stare", continue to be popular in spite of my efforts. Another tool, used less frequently, is the "block" feature. 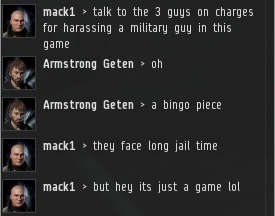 Blocking another player makes their chat in local invisible to you, and it prevents them from sending you EVEmails, etc. When you block a member of the New Order who's trying to help you, you're no better than a book-burner. A burner of valuable books. 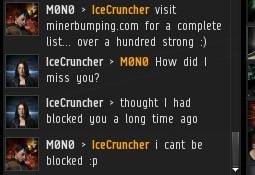 Highsec miner IceCruncher had barely gotten to know me when she decided to abuse the block feature. Who is IceCruncher, and why did she respond this way? She has no bio. 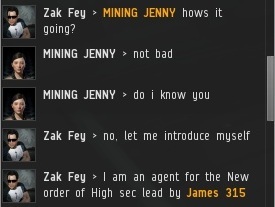 Like many highsec miners, she belongs to a generic corp but mines on her own. Add it all up, and it appears IceCruncher is seeking oblivion. The New Order to the rescue! 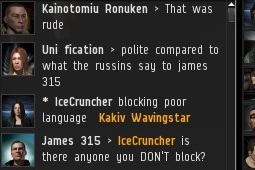 After some random person directed profanity at me, Icecruncher blocked him as well. Blocking people seemed to comprise IceCruncher's entire identity. 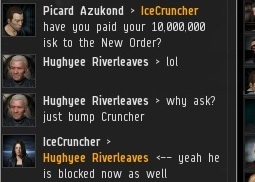 Just when Agent Picard Azukond was making a really great point about how the real harassers in highsec are those who don't do what I say, IceCruncher blocked him. So much for the exchange of ideas. I thought IceCruncher's corp was all about "divercity"? 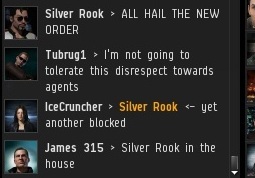 So maybe IceCruncher just hates the New Order and anyone who uses profanity in local. But Hughyee Riverleaves, a fellow ice miner, ended up in the crosshairs, too. At this point I would suggest that IceCruncher's choice of Halaima as her mining HQ may not have been optimal. Then came the day of our great bumper fleet. IceCruncher was overwhelmed. Everywhere she looked was an Agent... or a potential Agent. The problem with blocking bumpers is, they can still bump you. And no matter how many bumpers you block, there will always be more. 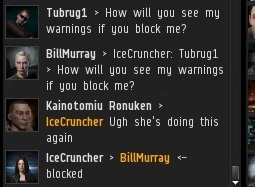 After Agent Tubrug1 was blocked, Agent BillMurray helpfully relayed Tubrug1's question in local. IceCruncher proved the old saying that "no good deed goes unpunished". Why do people who block others always feel the need to announce their blocks to the world? IceCruncher was consumed by her suspicions. Even a nice, innocent conversation could be the prelude to one of her blocks. The suspense was like something straight out of a Tarantino movie. In the end, there is no blocking the New Order. Blocking bumpers is like trying to block the future. We represent progress. I look forward to the day IceCruncher joins us. But she's going to have a lot of unblocking to do.